I believe that a vintage Breyer is a combination of many things, age being paramount. I think anything around 25 years or older is vintage. The plastic they were made of was different; feels different, looks different and yes, smells different! The Breyers that are "vintage" seem also to be more realistically detailed, and are more individualzed pieces of art than more recent Breyers are. They have more character, especially when referring to the older molds. When these components combine, hopefully they ellicit many fond memories of childhood horse games played out with these wonderful models that so many of us grew up with. I know from my own personal experience that my first Breyer was given to me by my friend for my 7th birthday. It was the black and white Pinto Western Pony in the then special see-through display case (which I still have). I was absolutely hooked on Breyers from then on! For me they were my saviors during the rainy days and winter when I couldn't ride my real horse as much. I have uncounted wonderful memories from them and each vintage Breyer I am lucky enough to acquire since still evokes a sense of childhood excitement and awe from me as I hope it does for others. I have this exact one what is she worth in excellant condition to a collector? I started collecting Breyer Horses from the 80's till the 90's...sadly I lost all of mine. They were very dear to me....I'm starting my collection over. 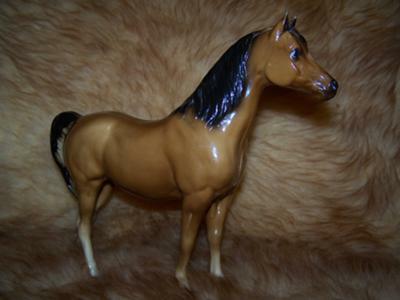 If anyone has an idea where I can find any Breyer Horses from those years, I would apperciate the help. jfbleakney@aol.com I live in Northern Arizona. Thanks! Wow! This is my first encounter with this page, sorry Bonnie. Normally I'm up on things, especially with this website. Lost a lot of animals this past year and just been tired I guess. That being said, I am so excited to see so many familar names! Awesome people whom I've met through ebay, buying and selling, as well as when I needed information about Big Al and his dietary needs! So "Hi" to Lisa and Celia and Gina!!!! I shall try to visit here often and I will work on getting some of my vintage photos up! This is good to know! Thank you for clarifying. She is a beauty and you are lucky to have found her. Great job!! Yes, she is the Old Mold Proud Arabian Mare! She has the straight front legs and is not restored in any way. I just love all the Proud Arabian Family molds! Is she an Old Mold PAM? Great picture of a beautiful model. One question though, is she an old mold PAM? Hard to tell in her picture. There is something very special about these really old ones. You just can't understand until you hold and feel a true vintage model yourself.